In a small bowl, whisk the soy sauce with the lemon juice, vinegar and garlic. Whisk in the 1/4 cup of oil until emulsified. Season with salt and pepper. Transfer half of the dressing to a medium bowl, add the cucumber and daikon and toss to coat. Let stand at room temperature for 30 minutes. Drain and squeeze out any excess liquid. Return the cucumber and daikon to the bowl. Light a grill or preheat a grill pan. Rub the steaks with oil and season with salt and pepper. Grill the steaks over moderate heat, turning once, until lightly charred on both sides and medium-rare within, about 7 minutes. Transfer the steaks to a work surface and let rest for 5 minutes. In a small bowl, combine the lemon zest and chile and season with salt and pepper; transfer the steaks to plates and spoon the gremolata on top. Add the arugula, sprouts and the remaining dressing to the cucumber and daikon and toss. 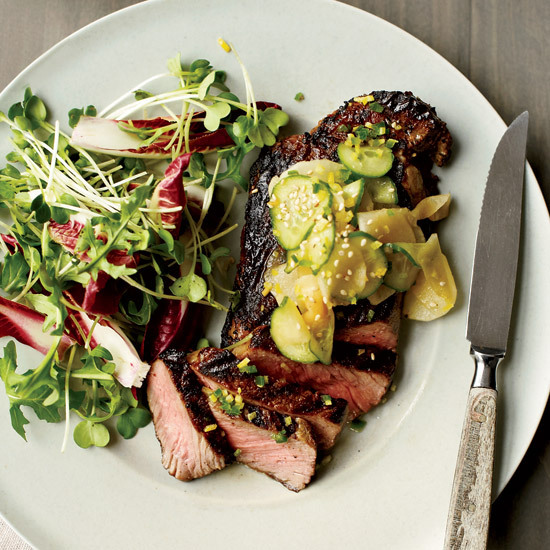 Serve the salad with the steaks, garnished with the sesame seeds.